Are you doing anything special for Thanksgiving? That’s assuming you’re in Canada, of course, as the U.S. one isn’t until November, and the Brits don’t do Thanksgiving at all! Tai Chi Man gets the Monday off work of course, and I usually do a bigger fussier dinner than usual. The plan is carrot soup (we have carrots in the garden), cashew nut roast with gravy, yam and potato wedges, roasted Brussels sprouts and salad, and a raspberry-topped chocolate-filled cake for dessert. I haven’t forgotten about the blog giveaway draw, I just haven’t got around to it yet, so if you haven’t left a comment on my post of a few days back, the one with a photo of the booty, then go do it quick! 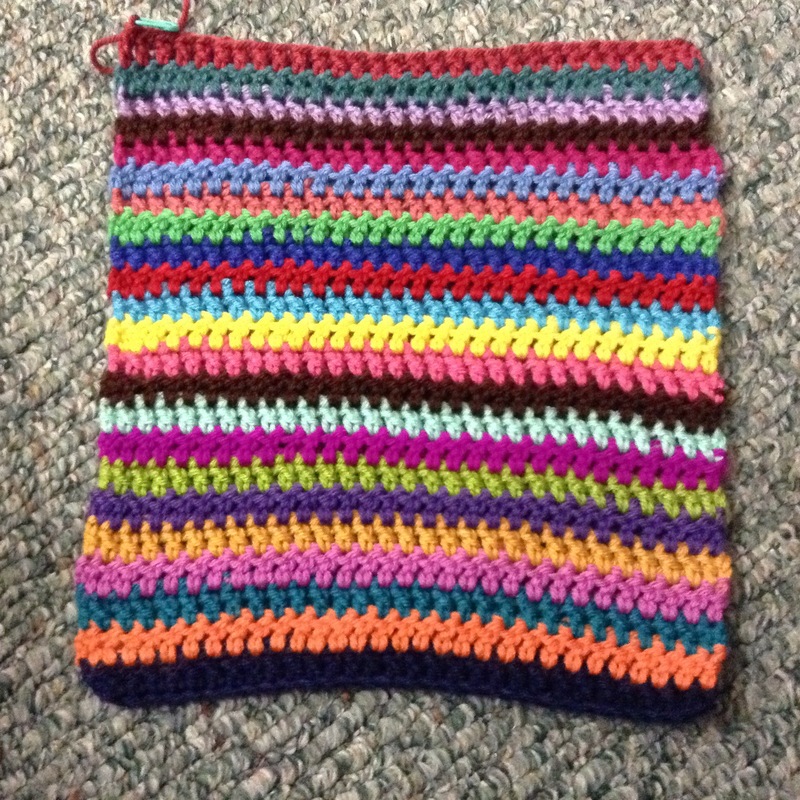 Last night I started the stripe strip on the Groovy-scrap-ghan and used all colours, the brown twice! Tonight I made a flower block with green, red and blue, while watching a movie. I was at the point where I was crocheting the first blue round and realized I was doing double crochet instead of treble. My brain is mostly used to U.S. terms now, but for some reason I ignored the fact that the pattern said “tr” and did doubles instead. Before continuing on, I had a realization that I was doing it wrong, and corrected it, but when I compared the new block to the first two I can see that the second one I made (the yellow, turquoise and pink) has doubles in the first round after the flower. I did consider redoing the pink, but I really don’t think it’s going to matter if I leave it. The size of the square is fine and if anything I think it looks better than the other two! Well, it’s time for bed so I’ll say goodnight and have a great weekend. Have a great Thanksgiving weekend. We have a family dinner today with all sorts of dishes to suit the meat lovers and the vegetarians in the family.